Dada with Amido while staying at our Boulder house in 1993. 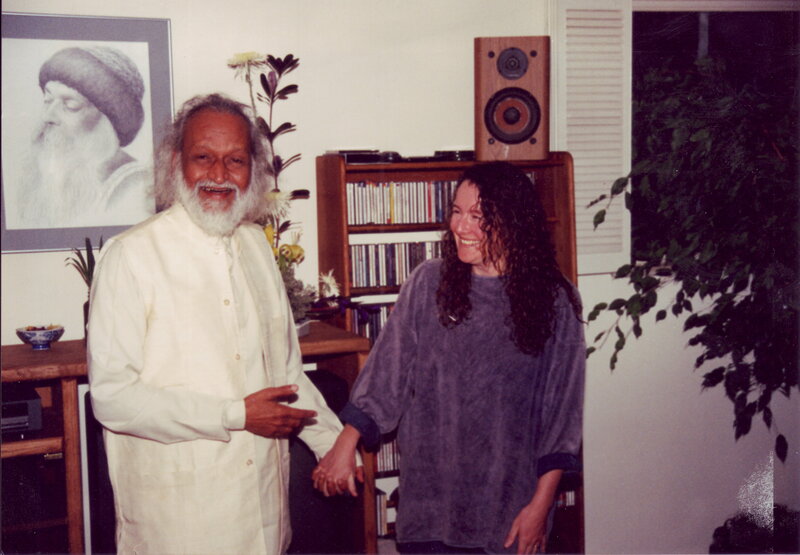 Sometime in the early 90’s, my friend Santap moved to Boulder, Colorado, and after settling in, made arrangements to bring Dada Gavand, a teacher that he had spent some time with in California, to town. He was sponsoring the visit and Dada would be staying with Santap in his mountain home. Dada’s visit coincided with my own inward turn and interest in self- inquiry as a spiritual practice. I read his books and very much appreciated his keen insight. They were prodding me in. Santap needed some help with the organizing and I was happy to assist. Dada primarily taught through one-on-one interviews but he did do a few public talks. Santap spread the word of Dada’s upcoming visit and organized a list of interested people for the interviews. Together we set up a public talk. Dada did not enjoy the cold. He was arrived from somewhere warm but was going to be staying in the Rockies at about 9,000 feet in the fall. Amido and I offered to host Dada down in town if he wanted, but he liked to stay with people he knew. Amido and I had an interview together and this meeting with Dada was very helpful for me. Up to that point I was still thinking of “going inside” as a journey, as a movement through some imaginary inner space. I don’t remember the exact words that were said but there was shift and I understood for the first time that “going inside means not going at all.” This was a major insight. Dada recognized that a shift had happened and later suggested to Santap that he would like to spend half of his time in Boulder with us. It was a complete joy to be with him in the house even at the ninety-degree requested temperature. One thing I found interesting was that we would be sitting and chatting around the dinner table and suddenly some kind of shift would happen. The atmosphere would change and there would be a palpable silence. It was almost as if a presence had descended or the entire room had been lifted to a higher dimension and he would then speak as the spiritual teacher and even his speaking mannerisms would alter. He began to use the first person plural and say “we” rather than “I” in those moments. Dada’s story is quite unique. He had been part of the Theosophical Society and known U.G. Krishnamurti before either one of them experienced their transformations. They met up after those experiences and it was at the urging and even help of U.G. that Dada set off for the States. Dada had also spent time with Meher Baba and J. Krishnamurti. The mind is the product of time. Whereas Godhood is timeless divine. Time cannot contact the timeless. Contracted polarity cannot contact enormity. are the cause of disquiet. nor experience the timeless through time. Thought cannot meet the omniscient. The eternal cannot touch the transient. will invite the hidden divinity. to experience that which is beyond the mind. your Lord, the timeless divine. At the end of his stay Santap and I took Dada to the airport. I was, of course, sad to see him go; such a sweet friendliness had surrounded us. We said goodbye and Dada boarded the plane with his carry-on. He believed in carrying his own baggage even in his late 70’s. A few years later, after Amido and I had moved from Boulder to Crestone , Colorado, we talked to Dada on the phone with the idea of bringing him there but it wasn’t to be. And in 2007, while traveling in India we emailed his contact person, thinking perhaps we would visit but he was in silence and not accepting visitors. Dada left his body in 2012. There is a website maintained for Dada at mysticdada.org. Thank you very much for sharing this book by Dada Gavand and his INSIGHTS into human mind! Dadaji passed on January 29, 2012. Thank you Dada for your presence and for goading us on. Charaiveti, charaiveti.